New Year is like a bridge. If you had a difficult period without many accomplishments, but many failures and disappointments, you can step into the next year with a more positive attitude, boosted confidence and a new strategy or plan. If you were selfish, inconsiderate and antisocial, once again you have the opportunity to mend your faults and become a better person. Yes, it sounds like a cliché, but it is the truth. In fact, you have more than one single chance to prove your qualities and your human side by helping others and becoming an active part of the community. If you own a business, you have to adopt a more objective, straightforward and competitive attitude because the corporate world is fierce. On the other hand, if you also have a family, you cannot help but be more playful with your children, inspire them to act not only in their favor, but to also think about others and give back. The main idea is that you own a business but you are part of the community, which means that your business is also part of the same community. Many people choose to volunteer because it represents the best method to express your kindness, help the environment and improve other’s lives. While going to the mall, buying gifts and enjoying family dinners are basic activities that you do during the festive season, you should always remember that all have the same luck as you. Even more, some of them do not even have a family. Therefore, apart from putting gifts under the Christmas tree for your family, you can also give more to other members of the community. Business owners or those who managed to build wealth over the years choose the easiest option, namely to write a check or give money. However, this does not show that you truly care. If you get involved personally or dedicate yourself to a cause that you care about proves that you care. If you do not know where to start, do not worry. There are plenty of organizations out there, such as amp the cause non-profit that need volunteers. Furthermore, there are so many simple ways though which you can work with children, help elders and support the arts that you cannot complain about the process. You help others by doing good deeds and you get back spiritually and mentally. You develop that positive side more, you gain a new perspective on life, and you surround yourself with kindness and caring people who never take a step back when it comes to sharing. You might not realize now, but volunteering has the potential to change a person. Just by bringing your small contribution, you create a big impact on the community as a whole. You build respect among people and a good reputation. People will appreciate your efforts and always remember that you struggled to make a difference. If you join forces with other volunteers, together you can create a better place for children and a more beautiful and healthier environment. You can start with small actions, like cooking or collecting food for people in need, donating blood or clothes, coach a team or mentor a young student, assisting seniors in need, raising money and helping a neighbor or even a stranger build his dream house. All these represent steps towards a better you. Obviously, when you give back to others, they benefit from your great-heartedness the most. Nevertheless, you also benefit from your own actions to a certain extent. You cultivate personal growth, improve your self-esteem and your state of mind, and strengthen your immune system as well as the bonds with neighbors, strangers and even business competitors in the community. By engaging in beneficial activities and helping others, you feel good and you have a better opinion about yourself as a human bring. Charity improves morale; there is no doubt about it. Even more, you should encourage all your partners or employees to follow your example and focus their attention towards those in need, especially on New Year, which represents the ideal time for giving. Even though we should adopt the same attitude throughout the year, there is something about New Year. It simply inspires us to share, give back and open our hearts. Taking into account that you run a business, you have the possibility to bring a more significant contribution than the average person does and although you do not need a reason to help people, you should know that your business could benefit greatly from this. Your business helps the community develop and creates opportunities for children and the community helps your business grow. 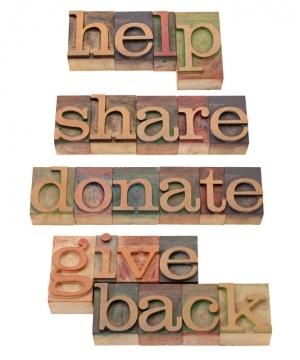 By doing this, you not only give to get, but you also inspire those around to give. Sometimes, even without expecting something in return. First, joining forces with your team for participating in different activities and events meant to improve the community will cultivate team camaraderie because after all, you are all working to reach a common objective. If the members of your tem learn how to collaborate, they will approach and solve issues or overcome any business obstacles. Moreover, this objective will distract them from the monotone routine; some of them may even discover their new passion, namely to help others by getting involved in development projects. Once you get the chance to work with your team outside the office, you are able to know them better and discover possible common interests. Depending on the type of business you own, you can do various things to help the community. Starting from donating products or services and mentoring programs to becoming a sponsor for an elementary class and requesting charitable donations, there are several methods you can use. As long as you have the financial support, all you need is large-heartedness.